Quilts and Pies, Oh My! Ok, here’s a random, jumbled post for you. I made a cherry pie last night with two jars of morello cherries I got from Trader Joe’s a few weeks ago. It was spectacular, if I do say so myself, and there is a very good reason for that: I tried a new crust. For years I have only used the pie crust recipe handed down for generations in my husband’s family. And I was very happy with it. But then I saw the latest post over at Smitten Kitchen and thought that her crust just looked……irresistible. So I tried it. And good lord, it is the best crust I have tasted in my entire life, I kid you not. I urge you all to try it immediately! Other than pie – making I have been doing woefully little because of the massive heat wave we have been experiencing. The animals are unhappy, I am unhappy….it’s just beastly out there. Fortunately I have plenty of shade for them and I hooked up a misting attachment so they can get some moisture on them to cool off. Tomorrow is supposed to be about 100, so wish us luck with that. 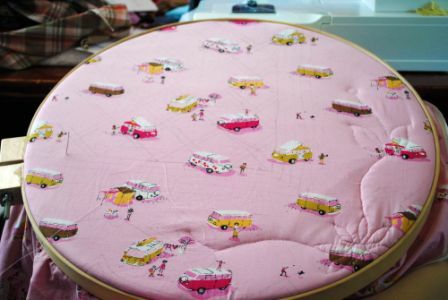 Mostly I have been sitting in the A/C working on handquilting. I started this….two years ago? Anyway it’s easy and doesn’t require much effort, which is good because seriously I just need a hammock to hang out in and take lots of long, summer afternoon naps. That’s all I want do do right now. How about you? How are you beating the heat? If you’re looking for good reading I highly recommend The Girl With the Dragon Tattoo and its sequels. This entry was posted in Uncategorized and tagged food, Pets, Sewing. Bookmark the permalink. That’s funny, I have that pie crust recipe on my to-do list (along with one other). I’m glad you liked the ‘girl with..”books- I loved them, and was confused by some of the reviews. Just passed the 1st and 2nd on to my sister…dying to hear what she thinks. And looking for #3! Stay cool…we need to get you up to Maine!